Make sure that your WiFi password is correct. If possible, try to login to your WiFi network on your phone or computer using this password (just to make sure that it is correct). If you are unsure of your password, sometimes is located on the bottom or side of your router. 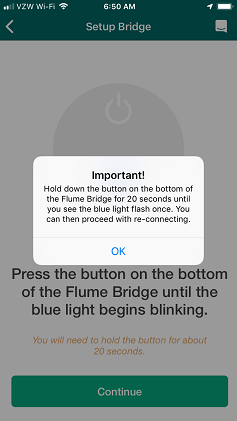 Make sure that your Flume bridge (the device that looks like a salt shaker) is reasonably close to your WiFi router. You can move it later, but it should be close to your router for this step. If the above steps don't solve the problem, then hold down the button on the bottom of the Flume bridge for 30 seconds. Then unplug and replug the bridge into the power outlet. Then try connecting again. If you see the following screen, please disregard the below directions. If you don't see this message, continue with steps below. Start walking away from your router and watch the WiFi signal strength on your phone. As soon as you lose one bar, stop walking (you may have to go outside). Go into the WiFi settings on your phone, and click the little "i" next to the network that you are connected to. Reconnect to the your WiFi network again. You will be asked for a password. At this point your phone will most likely connect to the 2.4GHz band. Go back into the Flume app and refresh the page by pulling down on it. If you are on an Android device, you shouldn't see a message asking you to connect to a 2.4GHz network. Continue the installation. If you still can't connect, then try a different location and repeat steps 1-6. If you have a router from AT&T, then you can turn on a 2.4GHz "Guest Network". To do so, just follow the steps in this article. If you still can not connect to WiFi, then please contact Flume Support.